For those who have been waiting on me to get more stock of Rain Saucers in, stop waiting and go ahead and order them direct from the manufacturer since they have set up a special discount code just for us. Use TCLYNX at the checkout for a discount between now and August 31 2013 to put in your order for a Rain Saucer. I highly recommend the version where you mount the saucer right to an open top barrel since where I live we seem to always get wind gusts right as the rains start which tend to upset the saucers if they are simply mounted and guyed off to the plumbing fittings (Kinda inverted umbrella in windstorm situation.) The saucer I’ve had mounted on top of an open top barrel has been stable and happy for the past year with no extra re-adjustment on my part and we have had some wind storms this past year that would have totally dismounted the saucers perched atop a 2″ pipe. This photo is of my set up at the old house, I was constantly having to re-mount those saucers and it was a pain being overhead like that. Really a bummer because they looked cool up there. I later actually used buckets to mount the saucers which worked much better. Anyone struggling with hard well water and their aquaponics system and no good roof handy to collect rain water? 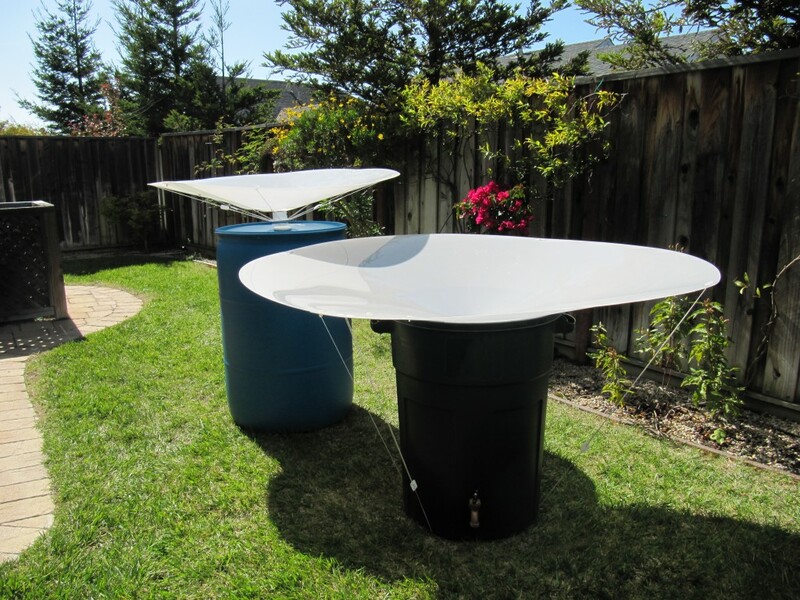 A rain saucer mounted atop a barrel or can will provide some nice clean rain water to help bring that system pH down gently and slowly. Much less cost than the initial price and ongoing filter replacements of Reverse Osmosis filters. What if you need water away from the house or hose? You can set up a rain saucer on a barrel to provide water for almost anything.